Here's the best news we've had since Harvey: we are set to open with limited operations this Thursday, and most classes will resume next Monday! We still have some finishing touches to sprinkle around and a few things to replace, but our textiles have been delivered and reinstalled, the whole place has a fresh coat of paint, and after much to-do, our floors are lovelier than ever! We are eternally grateful to our dedicated volunteers and generous supporters: because of you, we're in the home stretch! After a couple of days of nail-biting and pounding hearts, we finally met with the first wave of adjusters yesterday evening. There’s good news: there’s no indication of a lack of proper safety and prep for the project or treatment of the equipment that caught fire (the upside to being bonkers-level meticulous! ), and the insurance company’s representatives have been both friendly and supportive. On the other hand, we’re getting a much clearer idea of how they determine what will be cleaned or replaced versus what won’t be covered (like the tile floor of the bathroom) and what timelines and costs look like for getting crews in to make the space safe enough to work in. It looks like we may need a little more help easing into the gap between what insurance can help us with and the cost of maintaining the space without income for longer than we’d hoped, so we are raising our goal in the hopes of diffusing the blow. I am completely taken aback by the depth of the generosity of the dance community and our loved ones, the willingness of so many people to put word out about our situation (which has, in turn, given me the opportunity to read truly touching statements about how the studio has impacted the lives of artists that I love), and by the speed with which so many caring individuals have responded to the call for aid. Should we be fortunate enough to raise money past what the studio situation requires, I am working on setting up scholarship assistance for dancers whose lives and income have been affected by the storm as well as subsidized floor fees for instructors whose studios are out of commission during repairs. I’m equal parts sooty and grateful, and my heart has doubled in size over the last few days - I’m gonna need to start letting out the ribcage on those costumes. On Monday, 9-4, a faulty piece of rented repair equipment caught fire in the studio's smaller bathroom, and repairs have been temporarily suspended as Kim begins the harrowing process of navigating insurance claims and arranging for clean-up of the soot-stained, ash-filled space. The next few days will be a whirlwind of working out deductibles and meeting with adjusters and contractors. With the volume of claims, there isn't much info to be had in the way of time estimates. Our primary focus at this point is helping Dauntless to get things back on track in the interest of minimizing the impact to the artists, teachers, and students who depend on the studio. We're all feeling pretty overwhelmed by the set-back, but with your help, we're gearing up to tackle this new, slightly steeper, uphill climb. All funds received in the course of this fundraiser will be sent directly to Dance from the Heart D.B.A. Dauntless Dance and Movement to aid in covering the costs of cleaning up the awful mess made by the fire- every surface and object in the 1800sf space is coated in soot and ash-, making repairs to the bathroom, completing repairs to the dance floor (including replacing areas of support structure damaged by flooding and the resurfacing made necessary by the removal of affected areas of flooring), cleaning the ductwork, and making this beautiful studio a safe, comfortable place for or community once again. We haven't had much news for the past week or so as we've been doing the adjustor/contractor/bid dance and waiting for our turn with the fire restoration crews, but the initial clean-up is underway! Next up: getting the construction crew in once the space is safe to occupy. With the backlog of damage across the city, it's hard to get a time estimate for when we'll be back to full sparkle, but we're hoping to be clean and functional for a soft opening in the next couple of weeks! 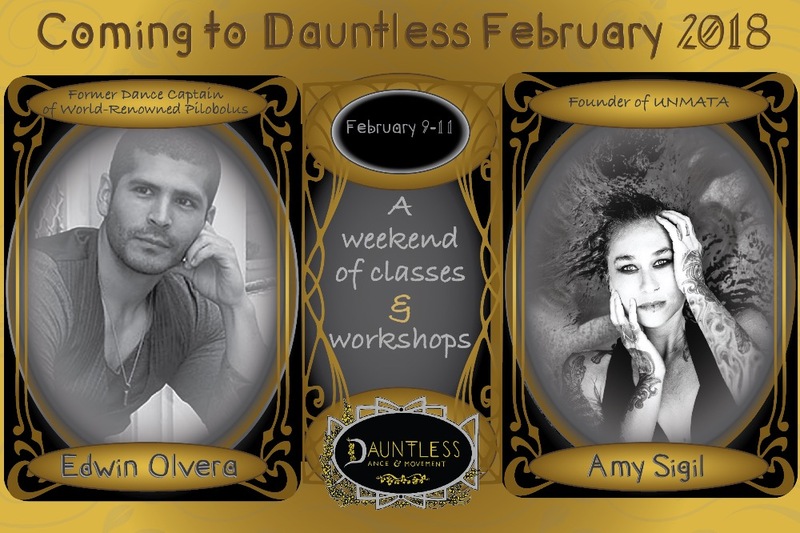 Though we may not quite see the light at the end of the tunnel on the repairs, we're thrilled to announce an event we've had in the works for some time: Edwin Olvera (former dance captain of Pilobolus Dance Theater) and Amy Unmata Sigil will be joining us in February for a weekend of cross-disciplinary movement workshops. We'll have full workshop details, pricing,and registration up soon, and space will be limited, so keep your peepers peeled! Friends and family…oh my goodness, you did it! YOU made our goal a reality. We are humbled and grateful for the outpour of love and support from our dance family. Stay tuned for updates as we move forward with restoration and recovery. 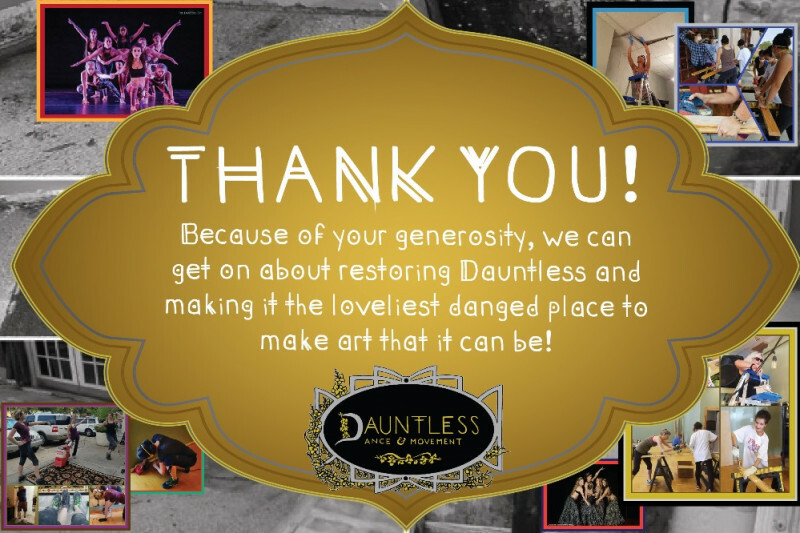 I am completely taken aback by the depth of the generosity of the dance community and our loved ones, the willingness of so many people to put word out about our situation (which has, in turn, given me the opportunity to read truly touching statements about how the studio has impacted the lives of artists that I love), and by the speed with which so many caring individuals have responded to the call for aid. 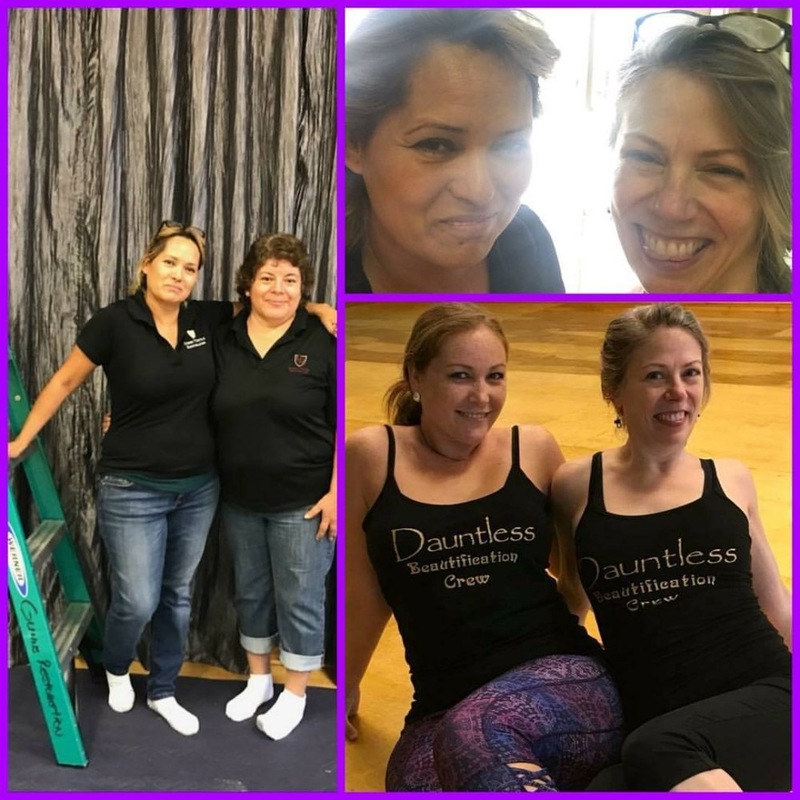 Should we be fortunate enough to raise money past what the studio situation requires, I am working on setting up scholarship assistance for dancers whose lives and income have been affected by the storm as well as subsidized floor fees for instructors whose studios are out of commission during repairs. I’m equal parts sooty and grateful, and my heart has doubled in size over the last few days- I’m gonna need to start letting out the ribcage on those costumes.